Stories and Songs by Gilles Vigneault Illustrations by Stéphane Jorisch Performances by Patrick Watson, Coral Egan, Thomas Hellman, Ndidi O and Jessica Vigneault. Welcome to the curious tale of a banjo-playing Cajun musician’s life in Kyoto, Japan. Old Man Joe—as he is affectionately called—and his Japanese wife often spend lovely Sunday afternoons drinking tea and collaborating musically with friends from distant lands. 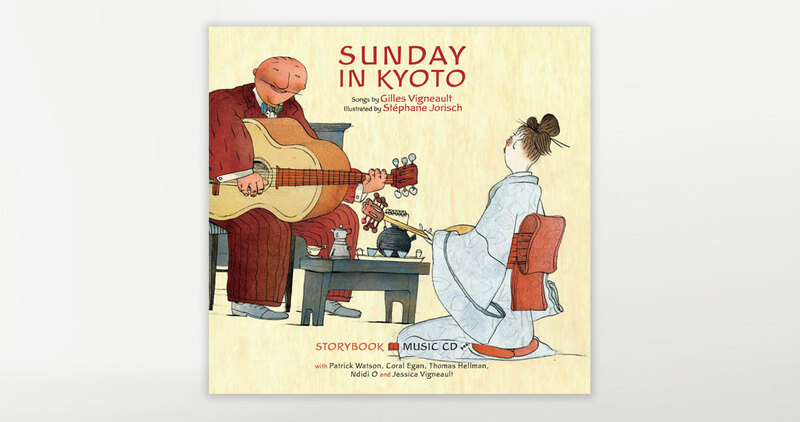 Each song is an introduction of sorts to quirky characters like Joe’s mother and Little Miss Adèle who calls herself “Hello.” The gentle watercolour images and mishmash of instrumentation give this book its added appeal. This authentic storybook with accompanying CD presents 14 unique songs that, although penned for children, appeal to all ages.